From time to time Calcbench likes to do a quick analysis of financial data, to see what aggregate numbers among many companies might tell us about corporate performance. Today’s metric: free cash flow. 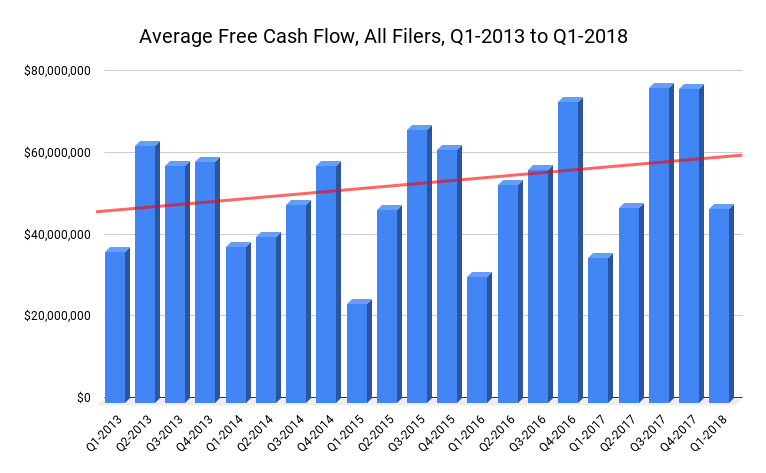 We last looked at free cash flow 12 months ago. “FCF” is a non-GAAP metric, generally defined as a company’s operating cash flow minus capital expenditures. That is, it’s the money that remains after the company pays to maintain its assets and operations. Why is FCF useful? Because it indicates how much cash a company has for non-essential endeavors: investing more in R&D, making acquisitions, buying back shares, and so forth. So we wanted to see what the latest picture looks like, among the S&P 500 and among all public filers generally. 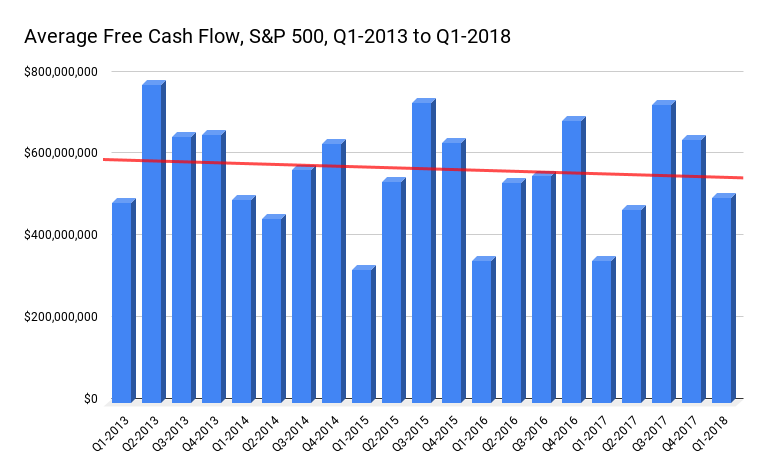 First is free cash flow among the S&P 500. We examined the average quarterly FCF per filer, from first quarter 2013 through first quarter 2018. As you can see in Figure 1 below, FCF fluctuates considerably from one quarter to the next — but the trend line, noted in red, clearly tilts downward. What might that mean? Well, we know that cost of revenue has been rising lately, as has Sales, General & Administrative expense. It’s also worth noting that FCF in first quarter 2018 is up sharply ($502 million) relative to first quarter FCF in the prior three years, when it hovered below $350 million. That coincides with the first full quarter after last year’s corporate tax cut, which put a lot of cash into company coffers. Hmmm. We could speculate that if FCF suddenly turns upward for the rest of 2018 — something we won’t know for many months yet — that might be tax reform at work. Once those quarterly statements arrive financial analysts might want to look more closely at specific companies to understand: is free cash flow rising because of smart cost management, or because of tax reform? We also have an FCF analysis for all public filers, in Figure 2 below. Here we can see the trend is decidedly upward, even if average FCF is much lower in absolute dollars (because we’re looking at smaller companies with smaller financial operations overall). On the other hand, we also see that same phenomenon of first quarter 2018 FCF much higher than comparable first quarters in prior years. Tax reform? Something else? We don’t know. But as always — Calcbench does help you see the trends at large, so you can ask the right question for the specific companies that matter most to you.